When organic material released from thawing permafrost is transported to the sea it gets broken down in the seawater contributing to a more rapid acidification of the Arctic Ocean, finds new research by scientists from Stockholm University and colleagues. Ocean acidification is an important consequence of humankind’s release of carbon dioxide (CO2) into the atmosphere from fossil fuel burning. It is widely thought that when excess atmospheric CO2 reacts with seawater it forms carbonic acid, which, in turn, “acidifies” the ocean, causing dramatic changes to ocean ecosystems. The Arctic Ocean is particularly sensitive to such changes. Now, a new study by scientists from Sweden, the USA, and Russia, published in Nature Geoscience proposes a novel mechanism for Arctic Ocean acidification involving release and subsequent breakdown of organic matter from thawing permafrost and carbon-rich river runoff in seawater. “It is predicted that accumulation of atmospheric CO2 in ocean surface waters will make the ocean twice as acidic by the end of this century. The Arctic Ocean is more sensitive to ocean acidification because more CO2 can dissolve in cold water. Our measurements show much higher levels of acidification of the Arctic Ocean than those previously reported by the IPCC (Intergovernmental Panel on Climate Change) among others,” says Örjan Gustafsson, Professor at ACES. “The East Siberian Arctic Shelf is an extremely climate-sensitive system that makes up approximately a quarter of the Arctic continental shelf. It receives river discharges from four large rivers, which transport terrestrial organic carbon as a result of permafrost thawing. In addition, the Shelf includes riverbanks, deltas and coastlines with thousand of kilometres of ice complexes. This system is strongly affected by global warming which has caused the steep coastline to erode by several metres per year, releasing old material from the permafrost into the seawater,” says Örjan Gustafsson. The team tracked the progress of acidification in the East Siberian Arctic Shelf by estimating the saturation state of aragonite, a soluble crystalline form of calcium carbonate, in water samples collected during research expeditions from 1999 to 2011. Aragonite is crucial for marine organisms to form their skeletons or shells. With fewer carbonate ions, the seawater becomes “under-saturated” with respect to aragonite. To pinpoint whether the source of CO2 is from the atmosphere or the land, the researchers calculated the isotopic signatures of carbon and oxygen in the water samples. “Our results show that carbon release from thawing coastal permafrost and growing river discharge cause persistent, and potentially increasing aragonite under-saturation of seawater in the East Siberian Arctic Shelf,” says Örjan Gustafsson. 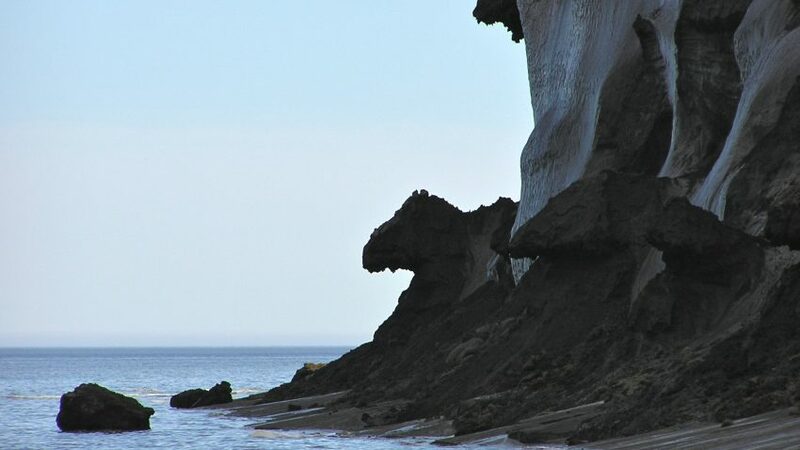 According to the authors, the “extreme” aragonite under-saturation in the East Siberian Arctic Shelf reflects seawater acidity levels much higher than those projected in this region for the end of this century, as these are currently based only on atmospheric CO2. “This indirect trigger of massive ocean acidification in the East Siberian Arctic Shelf illustrates the complexity of the Earth system under increasing anthropogenic pressure,” says Örjan Gustafsson.